The Global eLearning Market is projected to reach $49.6 billion in 2014. Now, more than ever, the integration of eLearning into many different business and academic environments requires a knowledgeable public concerning online information delivery. You want to make a well-informed choice for your organization’s needs. has the flexibility to offer training anytime, anywhere. Studies have shown that eLearning provides a stronger knowledge base for students. Whether used dually with traditional methods or as a stand-alone learning program, eLearning continues to prove its phenomenal value. Do you need a course quickly? 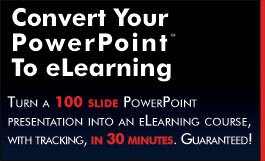 Existing, ready-to-import Power Point can be uploaded onto our DaC LMS in minutes. Add tracking and management, your course can be ready to deliver within 30 minutes. The ease of creating a course from Power Point is a popular feature for the busy training manager, educator, or entrepreneur with time constraints. Power Point imports easily into the Windows environment. The Design-a-Course Author Tool, included in the Corporate Training and eCommerce Marketplace accounts, allows you to create your own custom courses easily at a cost-effective price and with content to fit your organization’s training needs. One-click course upload makes publishing easy. Multimedia? Easy integration of flash movies, video, and audio is an valuable feature of our product. Your servers or ours – Our customers can choose to host their courses from oursecure, reliable Design-a-Course servers. Powered by Sun enterprise servers located in a secure facility; redundant hardware, power and internet connections ensure that your training is always available. A self-hosting option is also available, where we come to your location and install the product on your servers. SCORM Compliance. Our authoring tool can create SCORM compliant courses, providing protection for the investment in time and resources spent creating your training content. Our powerful, built-in learning management system makes your job easier — tracking and reporting student activity and progress, and providing a rich control interface allowing you to manage students and the courses they see according to the groups and roles to which they are assigned. Customer Service. You are our priority. We offer support through web-based requests, email, and toll-free teltephone access. You can monitor our activity and provide your comments and reactions through Facebook, Linked-In, or Twitter. We are always looking for new and better ways to stay in contact with our customers. Customization. Occasionally we have a specific request for LMS customization to meet individualized training requirements, such as integration with other systems or applications. Cost is dependent upon the type of modification needed and time required to complete the work. You can even submit your wish-list items through our web site. Contact us at 866.522.9839.